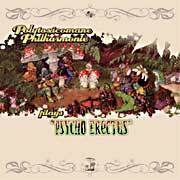 Polytoxicomane Philharmonie - "Plays Psycho Erectus"
How does Hans Georg find such cool music to release??? I have never heard of this project before but apparently the band has existed since the late 80's with members coming and going and doing a lot of other projects, but enough people have stuck to it that they were able to lay down a really cool record. This is one that really grows on you a lot. The Philmarmonie features 6 musicians with male and female vocals. "Poisonous Moth" starts the record and features fantastic early 70's krautrock meets Pink Floyd music. Fantastic sounds bubble up and in and out as the drums and bass line drives the composition (which is very improvised as are all the tracks). The vocals are more like spoken words. Fuddle Pie and Muddle Fie features a long guitar excursion, which is pretty spacey and has some cool effects. "Sulphur" is a more dark track to start with trading male and female vocals. The track develops with some excellent guitar and drums and horns and becomes a bit funky. Side B opens with the long (10 min) "Chanson Verte". This track starts to be built on the cool bass line with the exchanging male and female voices. The track slowly develops into a jazzy thing with sax and some strange soundscapes deep in the back of the sound that float up and back. "Too Sad, Lady Mushroom" is next and is one of the most laid back tracks on the record, and it features rain in the background for the first half of the track and the guitar line plays a beautiful melody which melts with the keyboards. An abrupt change happens in the middle (like a new jam was spliced in) and the song gets quite happy and spacey at the end. "Lokus Pokus" closes this great LP and features a guest guitar player and horns and is pretty jazzy with a bit of an eastern sound through it!